Daily: Our talented Chef will be very pleased to prepare your favorite dishes throughout the week. Dubai residents are a little spoiled for choice, with cuisine from the Indian sub-continent. The popular Indian restaurant, Gharana at Holiday Inn Dubai – Al Barsha, aims to coax diners out of their routine with four different regional menus: An intriguing invitation for guests to choose and relish various flavours. The Street Food Night menu at Gharana is as mouth-watering as the kebabs, chaats and tantalising biryanis that will whisk you away to the authentic tastes of India. 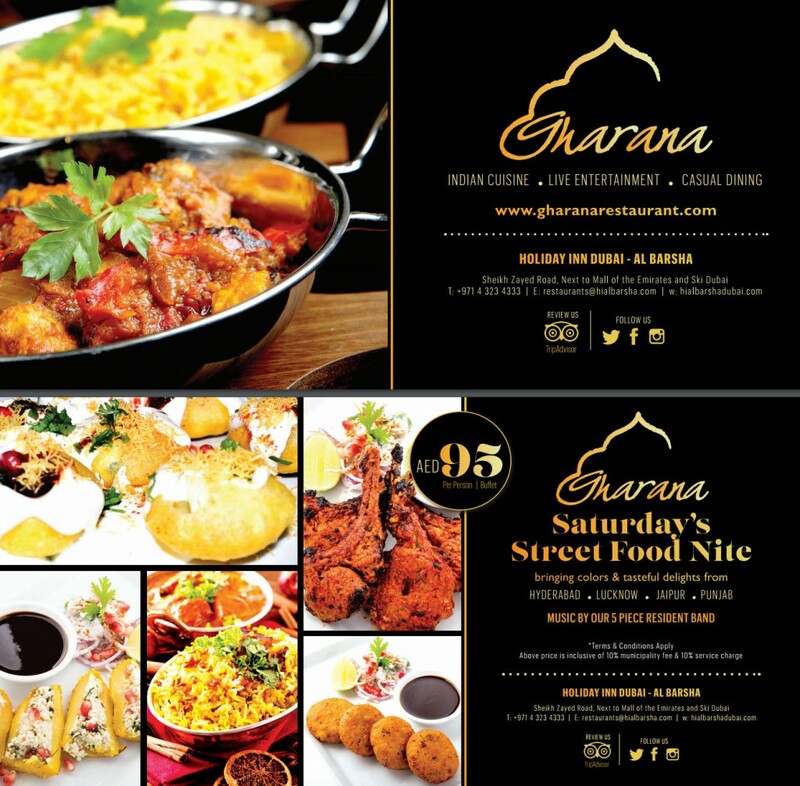 Saturdays will see a twist to Gharana’s regular cuisine bringing a novel experience of the ‘Galliyas’ (Streets) of Hyderabad, Punjab, Jaipur and Lucknow in a specialty ‘Food Night’. Diners can enjoy the pick of street eats with a wide variety of options to choose from. The Restaurant Manager, Ramesh Padmanabhan said, “Street food, but in greater variety, is as integral to India as the shawarma to Dubai or the hot dog to Chicago. Road-side vendors, mobile carts and stalls sell the freshest snacks with great panache and spirit. To make the most of the environment, Gharana infuses melodies from the mountains and the seas along with Gulzar – internationally acclaimed flutist – dishing out lilting live tunes on his flute. No Indian food experience can be complete without delectable sweets at the end. The Punjabi Gulab Jamun and Matka Falooda, the Lucknowi Lychee Rabdi and Kemami Zarda Pulao, and the Hyderabadi Phirnee promise to leave a pleasant taste in your mouth long after they are savoured.